If you've already read the INTRODUCTION in previous images, scroll down to FLORA AND FAUNA. This is the uncut, unfolded original artwork for the PopUp Card. The card interior photomontage was compiled in the "computer darkroom". Elements were selected from over 75 of my favorite photographs of Lick Observatory, Mount Hamilton, the Sierra range and beyond, which I shot during the years 2000 to 2007. These image fragments were digitally composited into a quasi-realistic but fanciful over the top montage (pun intended) depicting an early springtime visit to Mt. Hamilton, in late afternoon just before sunset, with a full moon rising in the east above Half Dome. In my eighteen years of residency at Lick Observatory, this season came to be my most anticipated. In early spring, a multitude of wildflowers can be found blooming at all elevations on Mt. Hamilton, including sturdy varieties rooted on the chilly and windy summit. High elevation snowfall is fairly common in spring months, and robust purple lupines and yellow buttercups are seen bent and cloaked by snow on rocky slopes of highway road cuts around Observatory buildings. One can travel though several weeks of seasonal variation condensed into the one-hour ascent from Silicon Valley to the 4200-foot summit. Within that short period of time, one might see relatively late-blooming Mariposa Lilies at lower elevations, early-season Hounds Tongues popping out at mid-level — and hardy cold-weather buttercups and lupines just emerging under frost at the top. Thus, a broad-ranging collection of wildflowers have been grouped together here. All plants and animals were photographed in their native Mt. Hamilton habitats and not in the studio. No blossoms were plucked from their stems, and great care was taken to minimize disturbance to the plants and to adjacent areas. The animals were untouched and photographed in their environment with one exception — the charming little horny lizard was photographed while sitting amiably and seemingly unafraid in the gentle hand of Wendy Hansen, a Lick staff person, in the courtyard of the Main Building close to where it was found. California’s native wildflowers are renowned for their year-round variety and colorful abundance. Mt. Hamilton is home to many species, including some that are rare and unique to the locale. As is true with other Mt. Hamilton residents past and present, I have come to befriend a number of individual mountain plants and I often return to their little section of turf to visit throughout the year, both with and without my camera. Several of these “buddy” plants are shown in the PopUp. Although enchanting — and often spectacular — when blooming, the plants are fascinating to observe throughout their entire life cycle. They invariably yield subtle surprises to the careful, persistent observer. The PopUp arrangement contains many of these favorites as photographed in their native locations, but as in most real-life gardens, a number of plants were not included due to limitations in space. If your cherished wildflower is missing from this collection I do apologize; several of mine are missing also. Botanists and native plant aficionados will note that considerable liberties have been taken in this grouping. For example, some plants are shade-and-moisture lovers, while others need bright sun and drier soils or rocky slopes. Although they are shown side-by-side in the PopUp landscape, many do not in reality grow and bloom simultaneously as close neighbors on Mt. Hamilton. The Popup garden should only be interpreted as an approximate and generalized representation of some of the species that flourish throughout an extended growing season in myriad, diverse, and specialized microclimates in the region. Fifteen species of animals, birds, and insects are represented in the Photomontage PopUp (sixteen if homo sapiens are included). However, persons familiar with the creatures shown here will know that not all would appear in this place at this time. One notable example is the tarantula in the lower left foreground corner, most likely a male traveling overland in search of a subterrainian mate — highly uncommon in spring. These arachnids are usually only seen in the fall (this fellow was photographed in October 2007), although I was both surprised and delighted to find one crossing the highway by Grant Park in the late spring of 2007. However, because I genuinely consider tarantulas to be one of Mt. Hamilton’s most magnificent creatures, I thought it imperative to include this stately if unseasonable gentleman here. A second anomaly is the bioluminescent glowworm (actually a beetle in the firefly family), whom I fondly came to know as “Hilda” during the three nights I photographed her in July 2005. (She can be found in the PopUp perched on a stem surrounded and camoflaged by cherry-red Indian Warrior blossoms, lower mid-right.) I found her conveniently camped in a patch of grasses on the side embankment of my driveway. In reality she would be found not in the spring daylight but rather around 9 to 10 pm on a dark summer’s eve, when a male suitor might be attracted to the provocative, twin lime-green lights twinkling on her lower abdomen during her incessant wiggle-dance on the tip of a grass stem flagpole. During an evening walk I’ve seen as many as five lady glowworms here and there in the grasses, gleaming brightly in the night like tiny and intense light emitting diodes. Although a small wetland puddle was placed in the PopUp garden as a home for the Banana Slug and California Newt, those creatures generally prefer more shady, cool, and moist conditions than have been depicted here. Can you find the bobcat on a tree branch? I am not by any means an expert on Mt. Hamilton flora and fauna. I invite and welcome contributions by those who are, or suggestions for links to informative websites. I will include and credit comments as appropriate with plant and animal descriptions. Viewers who are familiar with Mt. Hamilton geography will note that the PopUp highway and roadcut have been placed higher on the slope below the Main Building than was done when the road was constructed in the mid 1870's. This audacious digital rerouting allows a compression of features necessary to execute the semi-realistic Popup design while incorporating important geographical elements. Frequent travelers on Highway 130 will also know that it is surfaced in varying earthen shades of asphalt ranging from warm buff to black as the road loops up and over the mountain. In the photomontage, the buff color (as photographed at Grant Park in the lower left region of the card) is retained throughout so that the winding highway Popup path remains visually continuous to the viewer who has not actually journeyed upon it. 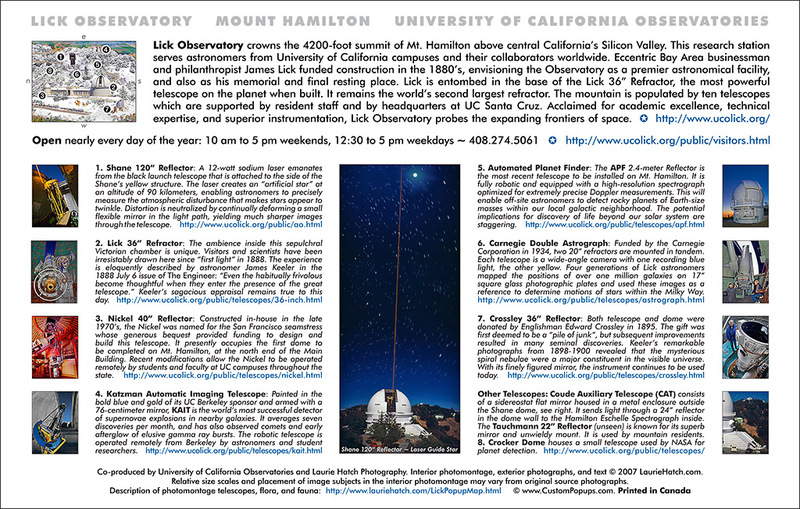 For more introductory information and a discussion of the LICK OBSERVATORY SUMMIT photograph in the PopUp Card, see the Cover image DESCRIPTION. Click directly on the images to see a larger view. Toggle your F11 key to see the expanded view in FULL SCREEN. Folded card dimensions: 8.25" x 5.25"
Dr. Ellie Gates is a Lick Support Astronomer and long time Mt. Hamilton resident, and is very knowledgeable about local flora and fauna. Her photographic catolog is increasingly comprehensive. Marianne Guntow is a Lick staff person and volunteer extraordinaire; she is also a local resident and gifted photographer (and that’s the short list!). She has created many superb images of the Mt. Hamilton region. All images and text are property of Laurie Hatch Photography; unauthorized use is a violation of copyright law. Or email giftshop@ucolick.org for ordering / shipping information. Shipping costs will be added: calculate for a 6.5" x 9.5" manilla envelope @ 2 oz. Folded card dimensions: 5.25" x 8.25", with A9 white envelope 5.75" x 8.75". Credit Card orders are accepted by phone only. Please do not email CC number. Checks should be made out to UC Regents. The "LICK OBSERVATORY" title script appears in the same antique type font on the card cover as it does on the brick facade of the Main Building entry portal, which was remodeled in 1929 after sustaining earthquake damage in preceeding decades. The Victorian-era structure first opened in 1888. The reader will note some common elements between the front cover photograph and the interior. The front cover image appears as photographed, but digital “snow” was added to it for the interior montage. Another image acquired during the same aerial photo shoot from a slightly higher altitude was also incorporated to “stretch” the interior composition vertically, so that PopUp cutting and folding could be more readily accomodated. The viewer will find that a number of other photographic details have been incorporated into the PopUp montage primary summit image, such as telescopes and interiors of the Lick 36” Refractor dome, the Shane 120” Reflector, and the Katzman Automatic Imaging Telescope. An early 20th century travel booklet states: “It is a liberal education to visit Mt. Hamilton. The vastness of the universe, the achievements of science are sufficient to fill the heart and to occupy the mind of the most intellectual and ambitious.” Formerly known as La Sierra Ysabel, “The Ham” is now populated by ten telescopes whose ages span over 130 years. Looking east from left to right, foreground: The Main Building houses the 40“ Nickel Reflector on the left; the larger open dome of the Lick 36” Refractor is right. In the middle ground are four domes left to right (only three are readily visible): the silver Crocker dome, the large Shane 3-meter Reflector, the Carnegie Astrograph (virtually hidden), and the 2.4-meter Automated Planet Finder. The dome of the 0.76-meter Katzman Automatic Imaging Telescope is in the center background. 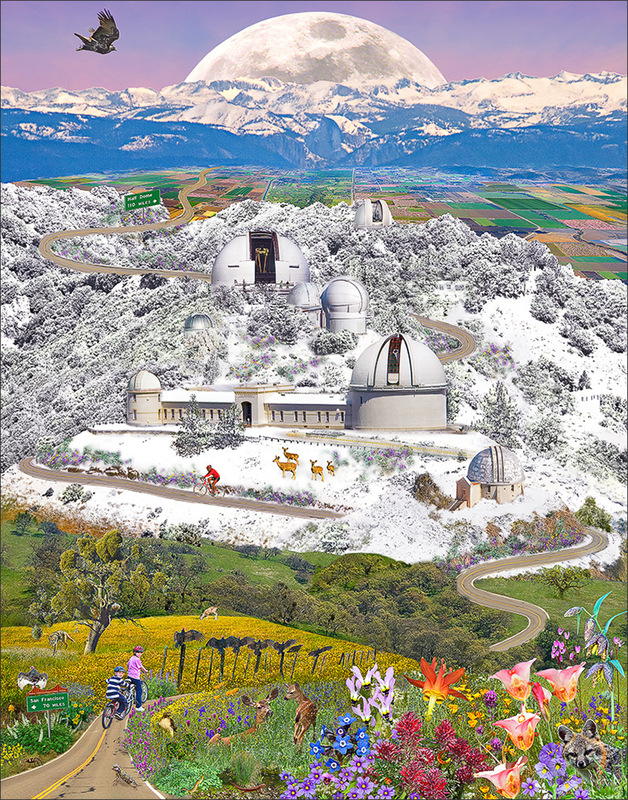 Lick Observatory crowns the 4,200-foot Mt. Hamilton summit above Silicon Valley in central California. This research station serves astronomers from University of California campuses and their collaborators worldwide. Eccentric Bay Area tycoon and philanthropist James Lick (1796-1876) bequeathed funding for construction which spanned from 1880 to 1887, fulfilling his vision of the Observatory as a premier astronomical facility. In 1959, the Shane 3-meter reflecting telescope was completed on Mt. Hamilton. It continues to provide data for forefront research and engineering programs. In total, the mountain top is home to ten telescopes which are supported by resident staff and by headquarters at UC Santa Cruz. 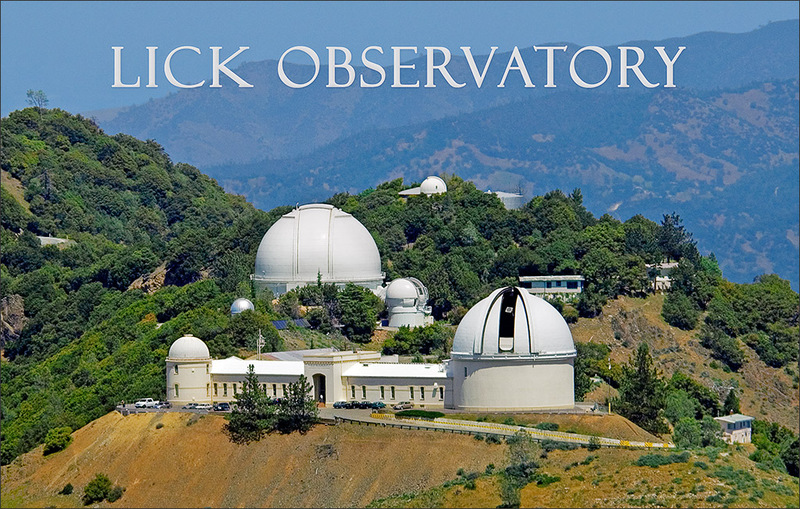 Acclaimed for academic excellence, technical expertise, and superior instrumentation, Lick Observatory probes the expanding frontiers of space. To learn more about FLORA AND FAUNA in the PopUp Card, see the Interior Unfolded image DESCRIPTION.